The Bolivian Salt Flats of Uyuni or (Salar de Uyuni) are one of the most magnificent places to visit in South America because they combine the stillness of the desert, amazing scenery, spectacular sunsets and even a rare animal or two. It’s not surprise this desert outpost attracts travellers, amateur and professional photographers, seizing the opportunity to take incredible photos that are a little bit out of the ordinary. 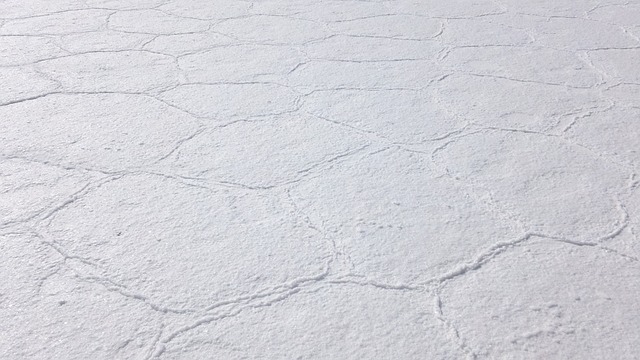 Yes, at more than 4000 square miles in size, the Uyuni Salt Flats are the largest in the world. (You can fit more than 400 football fields in just one square mile, so that is big!) 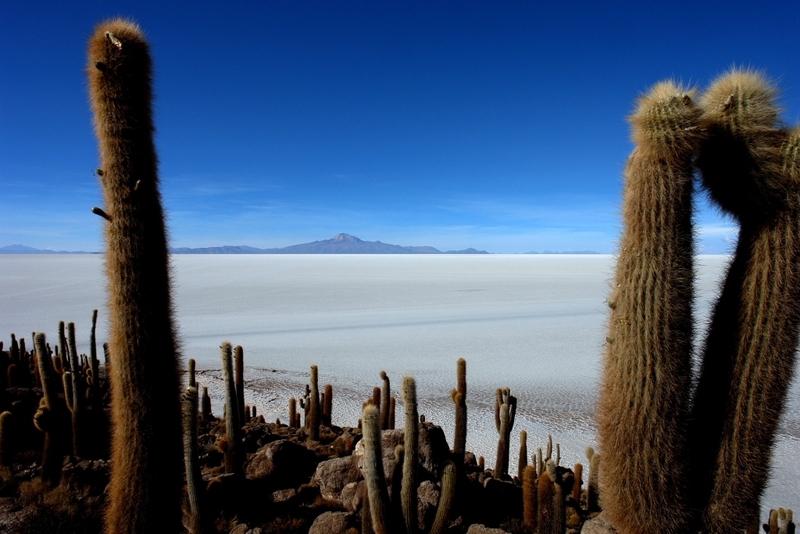 The lack of construction and industrialization keeps the Bolivian Salt Flats pristine. The stars are brighter and easier tosee than in more populated locations. 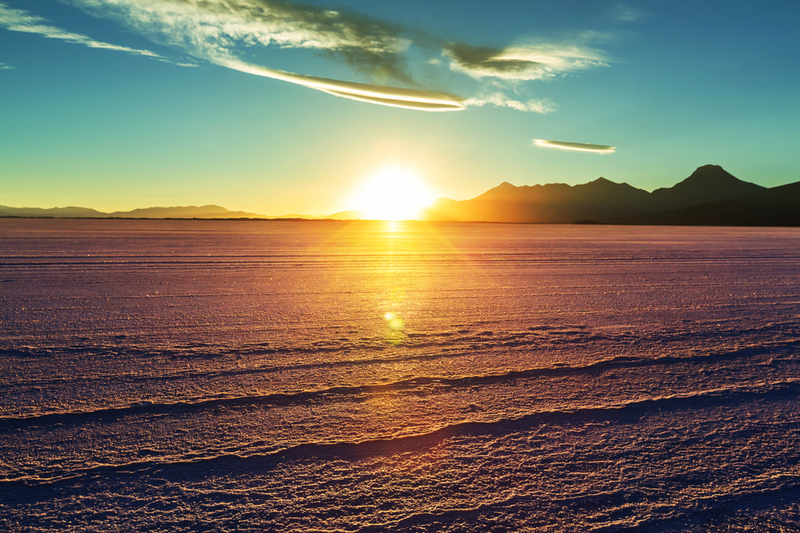 Vacationers looking for astounding beauty and serenity will fall in love with Uyuni. Whilst you may imagine scenes of a Salt Flat as nothing but white, this natural wonder comes alive at dawn and dusk. Striking reds, deep oranges, hues of blue and rich purples are just some of tones that paint the panorama and sky of Uyuni during sunset and sunrise. The exquisite features have inspired many photographers and writes, even artists like Salvador Dali are rumoured to have adopted imagery of these enigmatic salt plains in his work. Seen one salt flat, seen them all? Uyuni proves this idea wrong with each passing season. Travel here is broken into two seasons, the wet or the dry. The dry season from May through October? 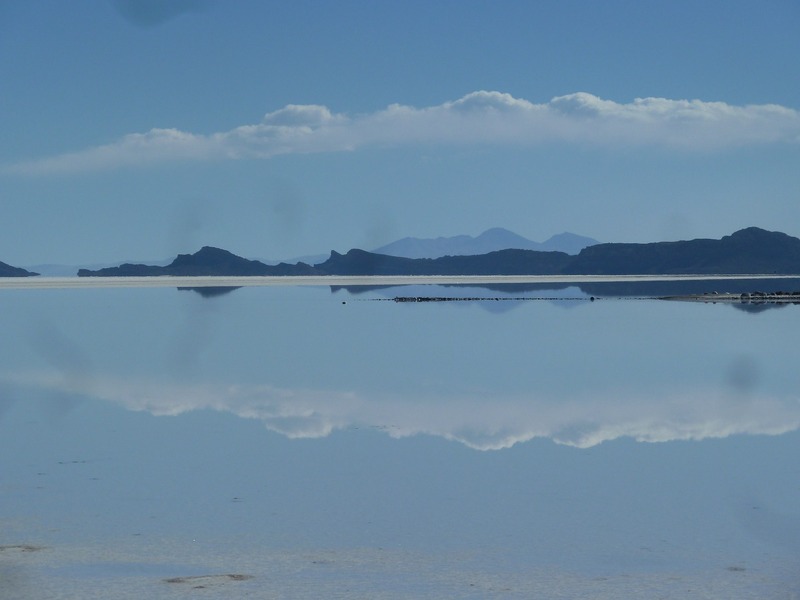 in Uyuni means skies for miles and the ability for visitors to go on 4 x 4 tours right onto the Bolivian Salt Flats. There is limited direct access during November to April, however visiting at this time can be arguably more spectacular. This is because the flooded desert acts as a mirror to the sky and surrounds, for some out of this world photography. This unusual reflectiveness gives photographers the ability to play with the depth of landscape, like never before. 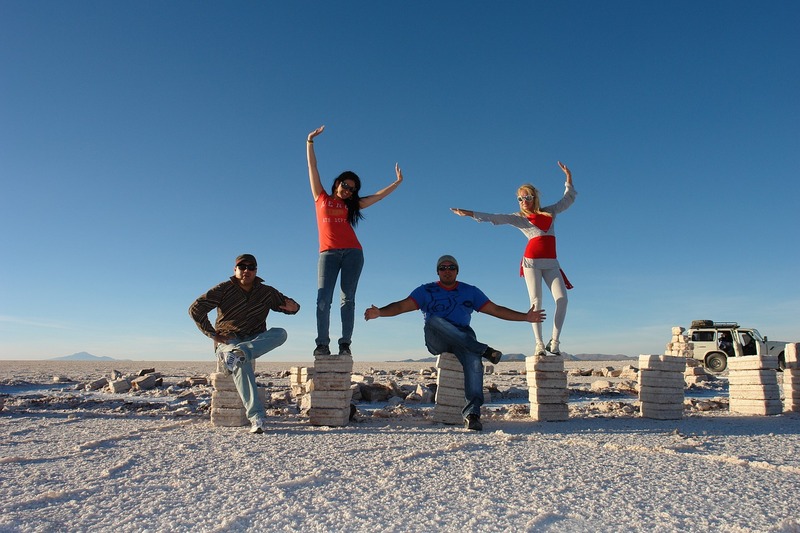 The Salt Flats of Bolivia are not just vast but also high. Located at more than 3800 metres above sea level, this is unequivocally high altitude territory. Take adequate precautions as you travel through here but bask in the feeling that you’re probably as close to the clouds as you can get on this earth. The Bolivian Salt Flats of Uyuni are home some distinct flora and fauna too. You have Incahuasi Island, an area home to giant cacti that looks surreal when placed against the stark landscape. These unique cacti grow at 1 cm per year and take over the island in stunning fashion. If you venture a bit further, you may be lucky enough to spot some pink South America flamingos,that breed here some months of the year. 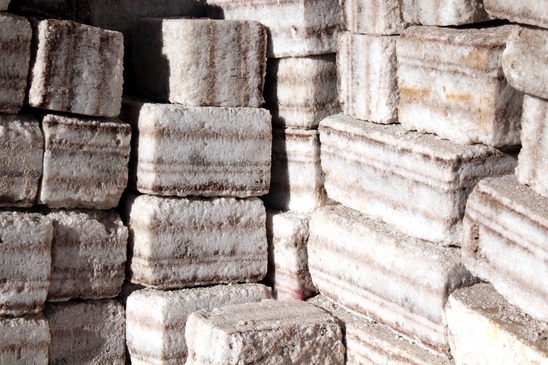 Yes, staying in a Salt Hotel is a reality. There are a few you can choose from like Palacio de Sal and Luna Salada where the exterior is made from the very surface of the mineral you will be standing on. Each hotel has amazing designs and features to enjoy and make for an absolutely unique experience and will be something you will be telling your friends about your experience of Bolivia for a long time afterwards.